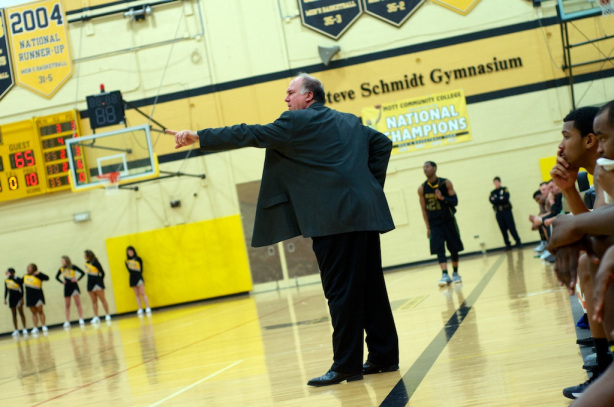 Mott head coach Steve Schmidt. In the not-too-distant past, Mott Community College was 5-0 and poised to prove the doubters, who didn’t think they could live up to the program’s reputation, wrong. Steve Schmidt’s team did not have a single returning player — one sophomore transfer and 10 freshmen. The team played its last game with seven players including two late-addition walk-ons. He had talent, albeit unknown and unproven. Three months later, with a roster decimated by self-inflicted injuries, the season came to an untimely end Tuesday night in Bay City: a 59-56 loss to Delta College in the opening round of the District 10 Tournament. His roster is now known and unproven. My records don’t go back far enough to find out when the last time Mott wasn’t playing basketball on the tournament weekend. Suffice it to say, this never happens. This was the team’s third loss to the Pioneers this season. Another starter, Rod Milton, couldn’t follow the rules and sat in the stands. Fitting, indeed: the four most-talented players on Schmidt’s roster starting the season, didn’t make it to season’s end. A couple didn’t make it to the quarter pole. I will publish a complete post-mortem on the season in the coming weeks Until then, trust that this team (and this program) will look a lot different next season. The revival starts tomorrow morning.